TerraForm investors have been taken to the cleaners over the past year. Here's why 8Point3 Energy Partners is a far superior high-yield solar dividend stock. 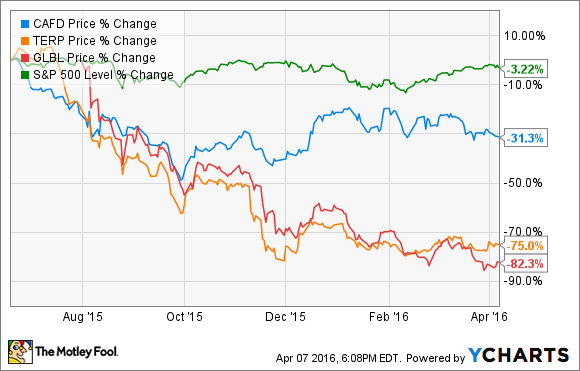 Over the past year, high-yield energy investors have had a rough go of it. Even stocks that have nothing to do with crashing oil and gas prices have suffered, including renewable-energy yieldcos 8Point3 Energy Partners (NASDAQ: CAFD), TerraForm Power (NASDAQ: TERP), and TerraForm Global (NASDAQ: GLBL). However, long-term income investors know that crashes often present the best opportunities to pick up high-quality stocks at deeply undervalued levels. The hard part is figuring out whether a stock's plunging price is justified or whether a dividend stock is a value trap. Let's take a look at these three yieldcos to see why 8Point3 Energy Partners is set up for long-term, sustainable, and impressive growth, unlike the TerraForm yieldcos that have proved so good at destroying shareholder value. While 8Point3 shareholders may initially focus on the 3.5% distribution increase for this quarter, as well as the guidance of another 3.5% increase for Q2, creating a forward yield of 6.7%,distribution sustainability should be the first priority of any yieldco owner. In Q1 of 2016, 8Point3 Energy Partners generated $18.3 million in CAFD, which comes to $0.258 per share, and generated a coverage ratio of 1.15, indicating that cash flow easily covers the current payout. Investors will also be happy to hear that 8Point3 recently acquired its second drop-down -- two projects, which are 50 MW and 40 MW, respectively. Combined with the earlier 20 MW Kern acquisition, these moves bring the yieldco's total solar power capacity to 542 MW. Management believes that this increased capacity will raise its annual CAFD by $12.3 million to $80.3 million -- excluding the temporary cash payments 8Point3 Energy Partners will receive from one of its sponsors, SunPower (NASDAQ: SPWR). 8Point3 Energy Partners has the potential to be a strong dividend growth stock over the coming years. However, investors always need to be skeptical of management guidance regarding payout growth and sustainability and ask, "Where is all this cash flow growth supposed to come from?" In this case, the yieldco's sponsors and general partners, SunPower and First Solar (NASDAQ: FSLR), happen to be two of the largest and best-run solar companies in America. They plan to sell 8Point3 Energy a massive backlog of future dropdowns, consisting of 1.21 GW of additional solar projects coming online through February 2018, potentially quadrupling its cash flow-generating capacity. Source: 8Point3 Energy Q1 presentation. In contrast TerraForm Power and TerraForm Global's distribution profiles show much weaker distribution profile's that seem to promise far less long-term growth. Note that TerraForm Global just IPOed so we only have one quarter of operating performance on which to judge its payout sustainability. Based on the severely distressed yields Wall Street is offering on TerraForm's shares, it's obvious that investor doubt the distributions are as secure as their respective DCR's would indicate. The reason why also explains the lack of strong distribution growth expectations for either yieldCo, despite SunEdison being the world's largest solar project developer. Given the theoretical size of SunEdison's drop down pipeline to its TerraForm yieldCos -- as of mid 2015 TerraForm Power had a total potential growth pipeline of 8.1 GW -- you'd think that their fast growth would be all but assured. However, because of SunEdison's impatience to grow faster than was sustainable the company now stands on the verge of bankruptcy. Not only does that throw into doubt the future growth prospects of TerraForm, but even increases the likelihood that they will follow their sponsor into oblivion. The collapse of TerraForm Power and TerraForm Global was mainly a result of two factors. The first was SunEdison management, which took on far too much debt to grow faster in the short run at the expense of long-term balance sheet sustainability. The second was lack of independent oversight at TerraForm. SunEdison would purposely structure deals to its yieldcos causing them to overpay for assets, something made necessary by its massive debt load. This has resulted in both TerraForm YieldCos being similarly burdened by massive debt loads and made profitable not only extremely difficult also threatens to force TerraForm yieldCos to follow SunEdison into bankruptcy protection. In contrast, 8Point3's dual ownership structure puts a greater emphasis on creating a sustainable platform to which both companies can drop down assets. It also has set up a more rigorous system though its management evaulates deals from the parent companies to maximize the chances of achieving a fair and profitable deal for its investors. There are, of course, no guarantees that 8Point3 Energy Partners can achieve its long-term potential. Should Wall Street continue to punish its share price, then it may not be able to raise sufficiently high equity growth capital, and its payout growth could slow. However, given the high quality of the long-term-focused management at 8Point3, investors have far less need to worry about its high-yield payout or the possibility of a bankruptcy such as exists with TerraForm.